The 2008 Child's Play Charity dinner auction is coming up next week, giving gamers a chance to dress-up for a good cause and possibly win the microwave oven of their dreams. While the Colorado Kotaku contingent readies for the annual Funde Razor event to benefit the Child's Play charity, the Penny Arcade guys are gearing up for their own swag-filled event in Seattle next week. 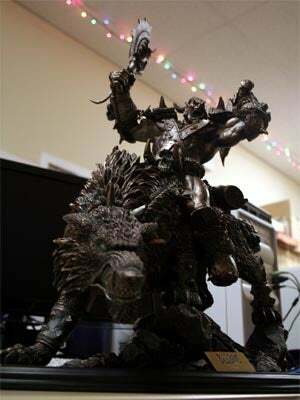 This year's event will see some pretty amazing gear auctioned off in the name of sick children everywhere, including a Master Chief helmet signed by Bungie, Rooster Teeth, and the PA staff; a bronze-cast World of Warcraft statue of an orc riding a wolf (pictured here); a black Dreamcast signed by former Sega boss Peter Moore; and an official Harmonix microwave. Yeah, not sure about that last one either. Tickets for the event are on sale until Friday or until they are all gone. $125 gets you an evening of fine food, game industry hob-nobbing, and a chance at a microwave you'll be telling your grandchildren about. Hit the jump for details. SEATTLE - Dec. 1, 2008 - Hurry before it's too late! Tickets are selling faster than the proverbial MMO on launch day for the 2008 Child's Play Charity dinner auction to be held on Dec. 9 in the Washington State Convention and Trade Center's skybridge; ticket sales will close this Friday, Dec. 5 (unless sold out prior). The event annually hosts over 400 videogame industry professionals and community members for an evening of drinks and silent bidding, followed by a plated banquet and live auction to benefit sick children in over 50 hospitals around the world. Contributions to the charity already exceed $450,000, passing the halfway mark for this year's goal of $750,000. Dinner auction tickets may be purchased at http://www.childsplaycharity.org/cpdinner.php for $125 per person, $60 of which is tax deductible. Corporate table sponsorships (seats 10) are still available. Contact klindsay@penny-arcade.com for further information.